Product #1284 | SKU 1004BAC | 0.0 (no ratings yet) Thanks for your rating! 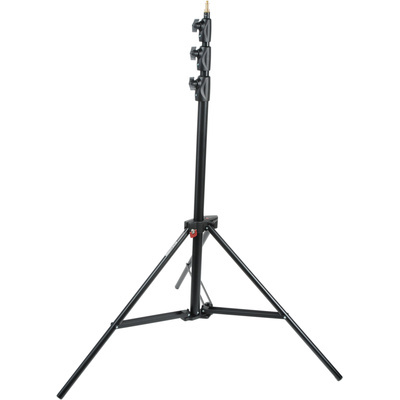 The 3.7 m Manfrotto Alu Master Air-Cushioned Stand is a lightweight support with an impressive load capacity. A clever design feature called QSS (Quick Stack System) allows the stand to fold flat, enabling several stands to be clipped together to save space in the studio or on the road. The Alu Master comes with a 5/8" (16mm) "Baby" stud,a 1/4"-20 screw, and a 3/8"-16 screw. It features air cushioning to ensure the soft descent of fragile equipment when the locking knob is loosened.